There’s a lot to appreciate about this artisan honey—like that it’s raw, Fair Trade, and GMO- and pesticide-free. But what makes it truly special is that it is monofloral, meaning it comes from a single nectar source—in this case, the flowering trees in the rainforest of Chile. It is sustainably harvested from the hives of a single beekeeper (who is paid fair wages) to ensure the distinctively delicious flavor of each jar stays pure. Dimensions: 3.25" x 3.25" x 2.25"
The Patagonia Rain Forest honey is delicious and flows like honey ought to. I've bought two different jars of the Rain Forest honey and enjoy the lovely floral taste and smoothness of the honey. I gave the rainforest one as a gift, and the recipient liked it a lot. He said that it was floral. Love love love, this honey. Very different taste to but very tasty. Patagonia Bee artisan honey began when co-founders Jacob Perry and Ross Ferguson trekked through Chile in 2011, and knew they had to go back. They did, and are now supporting that local beekeeping community with fair wages–and a way for them to share their unique honey. This raw and GMO- and pesticide-free honey is monofloral, which means each small batch is sourced from the nectar of one plant—in this case, from the flowering trees of the Patagonian rainforest. The fragrant flavors are deliciously different from traditional honey, which is often a blend from many hives, and even many countries. Any of the stand-out flavors make a tasty accompaniment to cheese or fruit or are delicious to enjoy on its own. 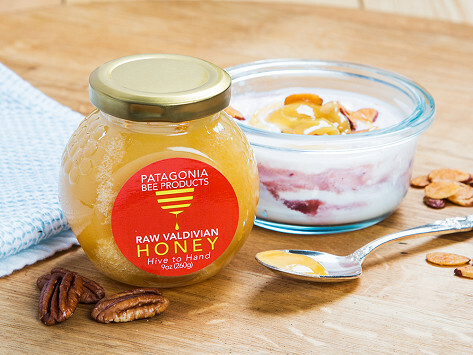 Because Patagonia Bee practices a hive-to-hand philosophy, each jar contains honey from hives of one beekeeper. This preserves the distinctive flavor of a single harvest, while giving an economic boost to the beekeepers.